While reading the Art Reviews in the New York Times, I noticed that some descriptions mimicked scenarios of my artworks … "a burning house" possibly the projected film installation of my farmhouse ablaze…"a see-ya-later-wink- wink" as playing dice spilled into a solid plexi-glass cube… "a tsunami of memories" as collages made daily from found media scraps, dream texts, and poetics. Using a razorblade, I cut-out text-blocks then placed each down the centerline of quadrille grid pages. Composing by stacking emphasizes constructing with language. Rorschach-like silhouettes echo and expand the experience. As with all poetics, the act of translation occurs between the slippage of word and image. 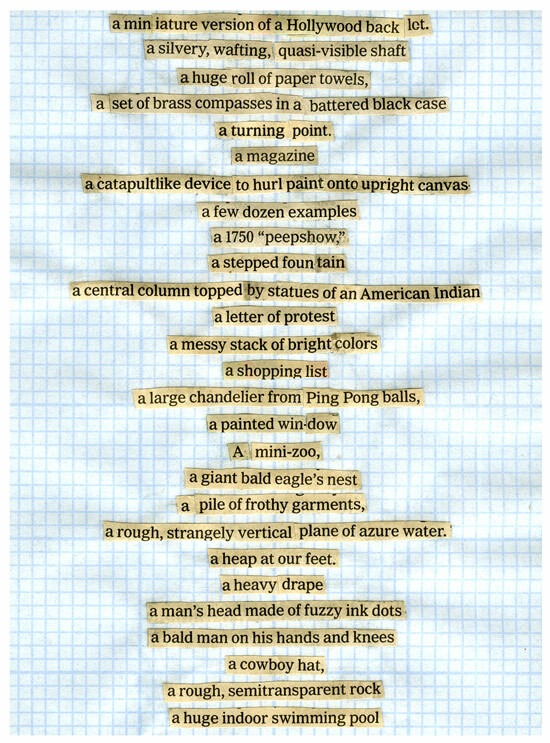 "a 1,000-piece work" is presented in the Lederer Gallery – State University of New York At Geneseo November 3, 2011. The accompanying works on paper installation was selected by Cynthia Hawkins – Director of Galleries.